As we discussed in our last installment, there is one major court case in the Karmapa controversy, that being the case of the Karmapa Charitable Trust to regain control of Rumtek Mona stery in Sikkim .The Trust seems to be winning this case. It has prevailed at two levels of the Indian justice system so far. Now, Situ and Gyaltsab Rinpoches have mounted another, final appeal to the Supreme Court. The Supreme Court is expected to announce its decision in July. If the Karmapa Charitable Trust prevails, then a process will begin to return Rumtek to the management of the Trust. Should this happen, it will not be a happy day for Situ and Gyaltsab Rinpoches. Then, it will be discovered just how many relics have gone missing from Rumtek’s treasury during Gyaltsab Rinpoche’s watch. We can only guess that this news would be discouraging for followers of Situ and Gyaltsab Rinpoches.A Blurry-eyed Account of Legal CasesIn this context, we find Lea Terhune’s confusing discussion of court cases related to the Karmapa controversy. On p. 231 of Karmapa: The Politics of Reincarnation, Terhune says that “Shamarpa continued to file court cases through his agents in Sikkim and elsewhere. Some of the cases go so far as to accuse the Dalai Lama of colluding with the Chinese. Most of the cases, which amount to harassment, were dismissed.” In an endnote, Terhune lists eight cases in particular that accuse “people who support the Tibetan cause and HH Dalai Lama XIV as being anti-Indian, Chinese spies and so on,” according to Deepak Kumar Thakur, an attorney retained by Situ and Gyaltsab Rinpoches (endnote number 170, pp. 296-298).This treatment of legal cases is typical of Terhune’s whole narrative. She starts with some genuine historical facts to establish credibility. Then she weaves these facts into a confusing web of half-truths and unsupportable claims. The result is a conclusion that is the exact opposite of the true state of affairs. In this case, Terhune claims that Shamar Rinpoche’s group is losing in court. In fact, the opposite is true—on the one major case in the controversy, to regain possession of Rumtek Mona stery, Shamar Rinpoche’s group is winning. Let us demonstrate this here by addressing Terhune’s major claims. First, Shamar Rinpoche has filed a small number of legal cases, but only one is significant for the Karmapa controversy, as we said above, the case of the Karmapa Charitable Trust to regain management of Rumtek. The other cases Terhune lists are either minor cases or filings by people on their own initiative without the participation of Shamar Rinpoche. We will discuss these below. Second, Shamar Rinpoche has never filed a case or authorized anyone else to file a case against HH Dalai Lama. This is by design. Shamar Rinpoche has deep respect for the dignity of His Holiness’ office and would not want involve HH Dalai Lama in undignified legal disputes. While there may be some cases pending against HH Dalai Lama, they were filed against the wishes of Shamar Rinpoche by people who are operating on their own initiative, separately from Shamar Rinpoche. We also discuss these below. Finally, Terhune omits a good deal of information about legal affairs that would be embarrassing to Situ and Gyaltsab Rinpoches. We will discuss this at the end of this piece, but first, let us detail the cases that Terhune claims were filed by Shamar Rinpoche. Aside from the case to regain control of Rumtek, all the others that Terhune lists are either unimportant cases or cases filed without the participation of Shamar Rinpoche, and, in some instances, against the wishes of Shamar Rinpoche. Terhune is correct that Dugo Bhotia, a genuine member of Shamar Rinpoche’s organization, did file two cases. She is also correct that one of these cases, filed in 1994, was against HH Dalai Lama for recognizing Orgyen Trinley as Karmapa. However, Bhotia did this on his own initiative before consulting Shamar Rinpoche. Indeed, once Rinpoche discovered that Bhotia had filed such a case, Rinpoche advised him to immediately withdraw the case, because, as we noted above, Rinpoche did not wish to file cases against HH Dalai Lama. Rinpoche also wanted to avoid any repercussions from Sikkim Chief Minister Bhandari, whose strong-arm rule we have discussed in an earlier installment. Accordingly, as Terhune notes, Dugo Bhotia did quickly withdraw this case. Then, in August 1998, Dugo Bhotia filed another case in the High Court of New Delhi against lifting the travel ban on Situ entering India . Terhune lists this as two cases, but it is in fact simply two filings in the same case. After Situ’s long-time friend and high-powered defense counsel Ram Jet Malani became Law Minister, he had removed the travel ban, and Bhotia filed a case to reverse this action. As an Indian citizen, Bhotia’s argument was that Situ Rinpoche still represented a national security risk and should not be allowed back in the country. In this case, Dugo Bhotia did not win everything he asked. However, he did win half. Let us explain. The court decided that it would not interfere with the decision of the government of India to lift the ban on Situ Rinpoche, which was, in effect, a fait accompli. So Situ Rinpoche won that part of this case. However, just after this decision, Dugo Bhotia re-filed his plea as a Special Legal Petition. In response to the SLP, the court decided against Situ Rinpoche, concluding that he should remain banned from eight nor thea stern states in India , including Sikkim , for reasons of national security. This decision quite spoiled the strategic plan of Law Minister Malani, who had planned to first lift the ban on Situ Rinpoche entering India, and then to gradually lift the state-level bans. Indeed, Malani’s action essentially backfired—now the eight-state ban was made permanent. This barred Situ Rinpoche from the areas he most wanted to enter, making his victory hollow. In any event, Dugo Bhotia’s case against lifting the travel ban on Situ Rinpoche was not an important case in the Karmapa controversy. It pales in importance to the Rumtek case. Terhune then lists other cases filed by Shree Narayan Singh. Singh is not connected to Shamar Rinpoche. He does know Rinpoche and has paid him occasional visits in the past, as a disciple of the late Sixteenth Karmapa. 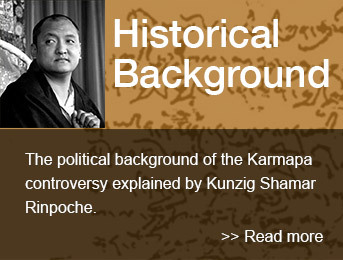 However, when Singh filed his case against HH Dalai Lama, Shamar Rinpoche strongly objected. Indeed, to distance himself from Singh’s action, Rinpoche instructed the staff of the Karmapa International Buddhist Institute (KIBI) in New Delhi to refuse admittance to Singh in the future. Shamar Rinpoche also contacted the Dalai Lama’s minister of religion and cultural affairs to inform him that he, Shamar Rinpoche, was not connected with Singh’s case. We will release the letters exchanged between Shamar Rinpoche and the Dharamsala administration on this issue in the near future. Suffice it to say here that the Dalai Lama’s government-in-exile acknowledged that it understood that Shamar Rinpoche was not involved in Singh’s case. The other case Terhune lists, filed by the Dr. Ambedkar Bodhi Kunj Foundation (a group unknown to Shamar Rinpoche) against the Dalai Lama and others, is also unconnected to Shamar Rinpoche. The Dharamsala administration has acknowledged that it knows this to be the case as well. Now that we have answered Terhune’s claims, we should address the biggest problem with her discussion of the legal cases in the Karmapa controversy—that she omits to discuss two cases particularly embarrassing to Situ and Gyaltsab Rinpoches. The first was an unsuccessful attempt by the two rinpoches to gain control of KIBI. The second were criminal charges filed by the New Delhi Police against the two rinpoches’ followers. First, we will discuss the case to gain control of KIBI. In 1994 Situ Rinpoche appointed his follower Orgyen Jigme to file a case against the Trust to seek possession of KIBI. Jigme retained Situ’s old friend Ram Jet Malani, the high-powered attorney mentioned above who would later become Law Minister and attempt to lift the travel ban on Situ Rinpoche. Between November 28 and December 4, 1994 , Taiwanese millionaire Chen Lu An, an associate of Situ Rinpoche, visited India . His first stop was Gangtok, to pay the large bribe to Sikkim Chief Minister Bhandari that we discussed in our previous installment (see “Setting the Record Straight #2,” May 20, 2004 ). After concluding his business in Sikkim , Chen proceeded to New Delhi to make another payment. There, in a meeting with Situ Rinpoche at the Sinclair Hotel in Siliguri, Chen presented $100,000 in cash to cover attorney Malani’s fees. As agreed, Malani filed the case in early 1995 at the High Court in New Delhi . The Trust as defendant was represented by attorney PK Ganguli. Much to the dismay of his client, Malani’s case turned out to be relatively straightforward—at the first hearing, the entire case was dismissed by the judge. This brings us to the criminal prosecution. On March 17, 1994 , during the installation of Thaye Dorje as Seventeenth Karmapa at KIBI, angry monks from Situ Rinpoche’s monastery in Himachal Pradesh, Sherab Ling, gathered outside to try to disrupt the ceremony. They threw stones at the building and attempted to enter the premises. A fight ensued which left one man injured and caused property damage. Afterwards, the New Delhi police arrested eight monks from among the protesters and began criminal proceedings against them for disturbing the peace. On September 15, 2003 at Patela House High Court in New Delhi, these eight defendants finally pled guilty, a full nine years after their arrest. In their guilty plea, the defendants admitted that they had organized the protest and initiated the stone-throwing. The court sentenced the defendants to time served and a promise not to interfere with KIBI’s affairs in the future. Poor Fact-checking or Propaganda Tactic? Terhune’s presentation here is quite misleading. Is she just an unskilled researcher? And did the editors at Wisdom Publications fail to sufficiently check the facts in her discussion? We do not know for sure, but we believe that this is not just a case of negligence. Indeed, we wonder if Terhune has intentionally twisted the facts of the legal history of the Karmapa controversy to make things look rosier for followers of Situ and Gyaltsab Rinpoches who would be greatly disappointed to know the truth. Followers in western countries in particular might be easily misled because they are far away from the scene of conflict and are unfamiliar with the intricacies of Tibetan exile politics. We believe that knowing the truth about these court cases will help people make up their own minds about the Karmapa issue. The only case that really matters in the controversy concerns Rumtek. When this case will be decided, then the controversy will surely be on its last legs. Situ and Gyaltsab Rinpoches know that their appeal to the Supreme Court represents their last hope, but that it is a dim hope at best. We hope that all Karma Kagyu followers, whatever their positions in this unfortunate controversy, might discover the truth for themselves. This can only help their practice. We also pray that once the truth is widely known, harmony will return to our ancient and noble lineage.